Two of the most famous painters of the twentieth century were serious Catholics: Andy Warhol and Salvador Dalí. Warhol was a regular volunteer among the homeless and visited the mass almost daily, but kept this painstakingly hidden. Dalí was more open about it and for instance illustrated a Bible edition with more than hundred watercolours (Biblia Sacra, 1963-1964). Dalí was Catholic by birth, but started taking his faith seriously only after World War II. Although he continued to make art for more than 40 years after the war, this period tends to be somewhat spirited away among art historians. This is also due to his great renown as a Surrealist: the empty planes, the dripping clocks, the elephants on stilts. Surrealism sought a kind of redemption in dream images, but the atom bombs on Nagasaki and Hiroshima brutally woke up Dalí and caused him to search in new directions. He first published a pamphlet, in which he – in his characteristic bombastic and flamboyant manner – defined himself as a ‘nuclear mystic’. From then on he wanted to find his inspiration in contemporary scientific discoveries and Classicism with its precise rendering of the human body and carefree depiction of biblical stories. His famous Corpus Hypercubus from 1954 forms the pinnacle of this period. – Dalí does not attempt to place the event in a historical setting. Christ is floating in an almost abstract space. – In the left lower corner you see his spouse and muse Gala as Mary Magdalene with remarkably luxurious garments. Dalí later explained that he wanted her to express the glory of humankind in this way. – The chessboard, wherein five black squares form a cross. Possibly this is a symbol for the various roads a life can travel. – Christ averts his head, so that we cannot look him in the eye. Is his face too holy for our gaze? Would we collapse under its weight? – Christ has no wound in his side, no crown of thorns on his head, no nails through his hands or feet. He is undamaged, invulnerable. As if he has already risen. – Both his knees look ‘messy’. In reproductions (like the one above) you can hardly see it, but when you stand before the original, you can recognize five images of Dalí himself in the left knee and five of Gala in the right one. As if they have been taken up in Christ’s body. 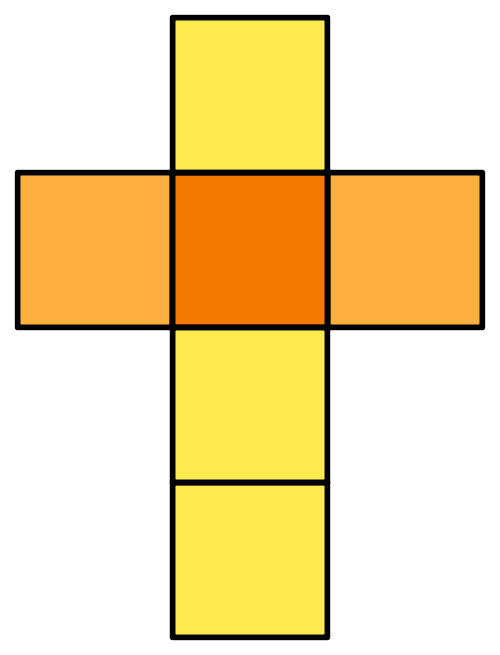 But the most striking is of course the cross. The title Corpus Hypercubus hints at its meaning. A hypercube is a four-dimensional cube. The cross in the painting shows this form in its ‘unfolded’ state. This is the stage you see in Dalí’s painting. 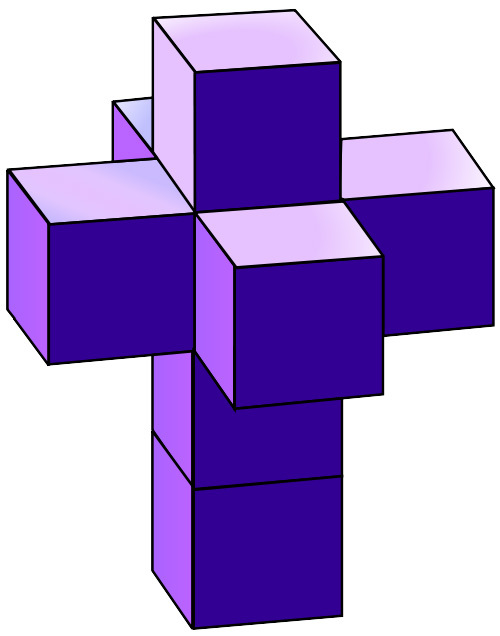 What in our reality is a symbol of suffering (the cross) can in a different reality be folded up into a symbol of perfection (a cube). 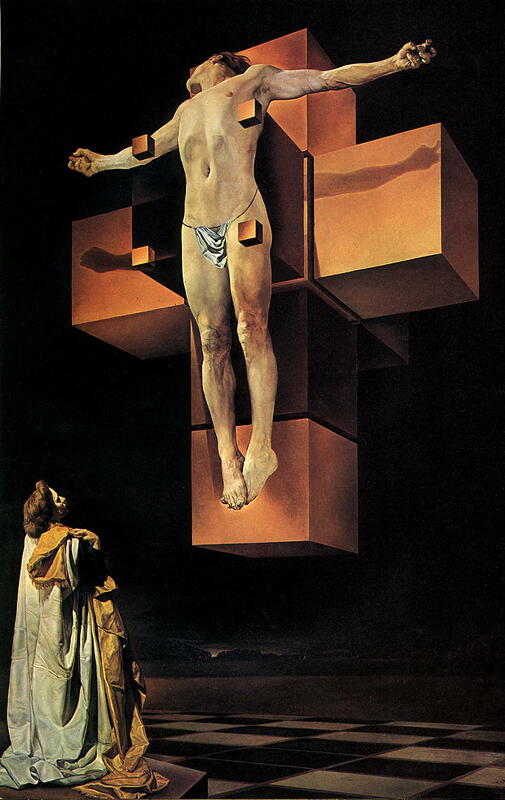 Dalí thus expresses the double meaning of Christ’s crucifixion, which already comes to the fore when John calls this drama ‘elevation’ (often translated as ‘glorification’). This is literally elevating someone onto the cross, but also figuratively that Christ has won a victory. Perhaps this is why Dalí represents Gala in such a worthy manner and Christ without wounds. As if we are already a stage ahead. As if time does not exist here. As if we look at this from a higher reality with many more dimensions than ours, where our pain can be ‘folded up’ into perfection. Salvador Dalí, Crucifixion (Corpus Hypercubus), 1954, oil on canvas, 194 x 124 cm. Metropolitan Museum of Art, New York. Salvador Dalí i Domènech (1904-1989) was a Spanish painter, sculptor, graphic artist and designer. After passing through phases of Cubism, Futurism and Metaphysical painting, he joined the Surrealists in 1929. Throughout his life he cultivated eccentricity, claiming that this was the source of his creative energy. His paintings employed a meticulous academic technique that was contradicted by the unreal dream space he depicted and by the strangely hallucinatory characters of his imagery. In 1937 Dalí visited Italy and adopted a more traditional style; this together with his political views (he was a supporter of General Franco) led Breton to expel him from the Surrealist ranks. He moved to the USA in 1940 and remained there until 1955. During this time his paintings were often on religious themes, although sexual subjects and pictures centering on his wife Gala were also continuing preoccupations. In 1955 he returned to Spain and in old age became a recluse. There are museums devoted to Dalí's work in Figueras, his home town in Spain, and in St Petersburg in Florida. Reinier Sonneveld (b. 1978) makes his living by creating short films and writing (mainly theological) books. He was the youngest writer in the Netherlands to receive the Prize for the Best Christian Book. He is also a member of the board of Artway.